Add "File description" to DLLs. In particular, what does ".dll" do? 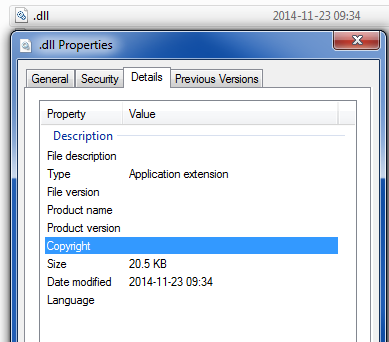 The ​win32 binaries of Pidgin version 2.10.11 brought a new DLL, named ".dll". There seems to be no metadata about that file. This made me look at other DLLs' Properties -> Details, and all lack any useful description. The .dll naming is a bug - it should have been nss-prefs.dll. It was fixed by [1648d789c7d2]. I don't think it's worth the effort to add the metadata. You're welcome to submit a patch.